I have to admit, I really love this tip for reverse tucks. Normally I am all for tucks on the outside, but this tip for accenting a tailored blouse with reverse tucks at the cuffs and hipline creates a very smart look. Ruth Wyeth Spears describes in detail how much extra fabric to allow, how narrow to make the tucks, and how far apart to make them. She just makes it sound so easy. 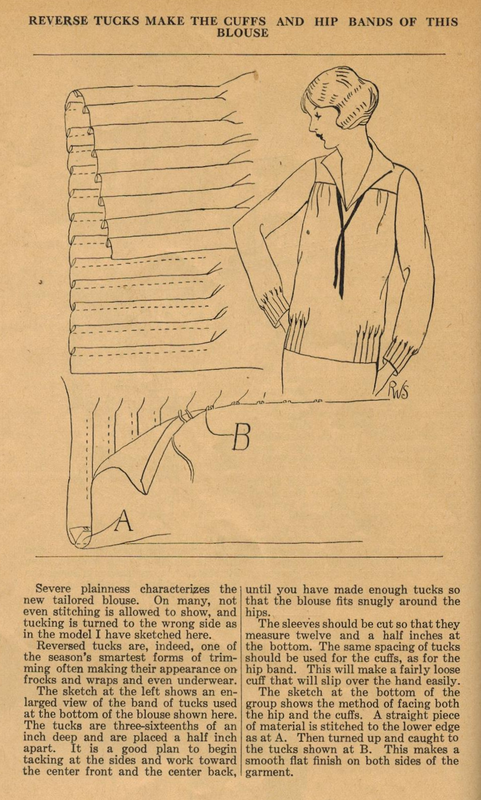 :) Turn any blouse into the latest 1920s fashion with this technique! Fascinating approach. It looks like early versions of bomber jackets, pre elastic! Ha ha!